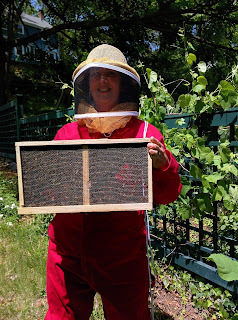 This morning I went out to check on the hive. I had thought that the amount of food I put out yesterday would last them for a few days. NOPE. It was all gone. I needed to refill it. The video I watched suggested using a turkey baster to refill the feeding dish. I didn't have that, so I used a condiment squeeze bottle. 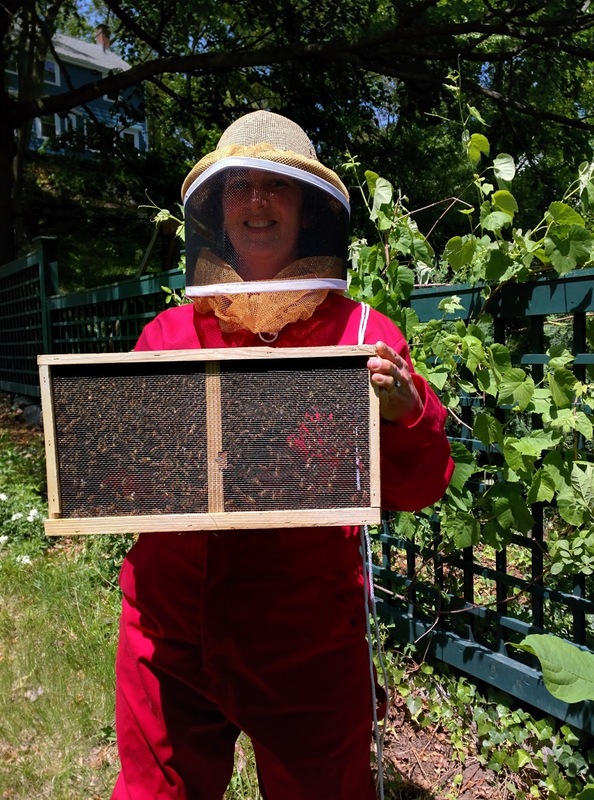 I got all dolled up in my gear and opened the hive. 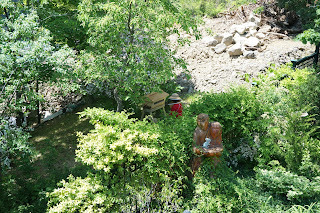 They were definitely more active, maybe even a little agitated, by me moving things around. 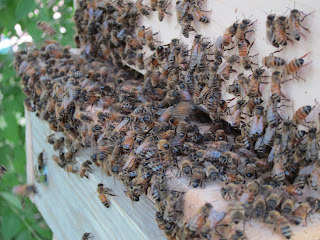 But as soon as I got the honey water in there, they started eating. I did not even try to check on the queen, there was a large clump of bees around her cage so I am guessing she's still in there. I did see a bee working on the little candy plug in her cage. What I don't know is, how long until they are able to forage for their own food? The pate held its form better than I thought it would! 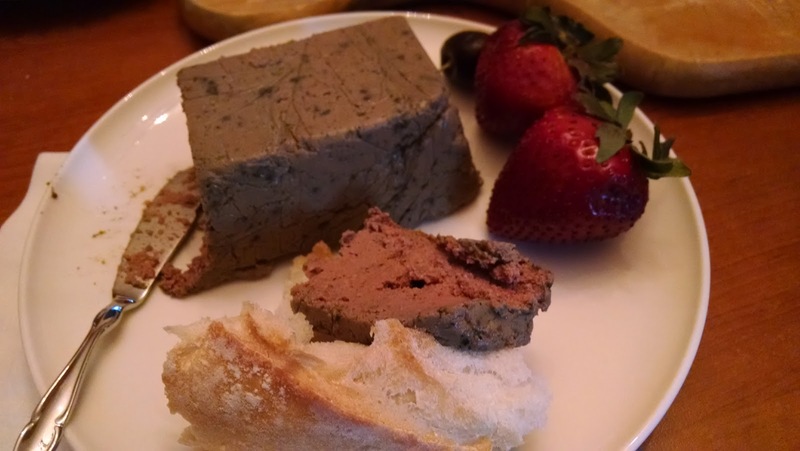 Every once in a while, dinner consists of pate, cheeses, and sometimes charcuterie, with bread and fruit. 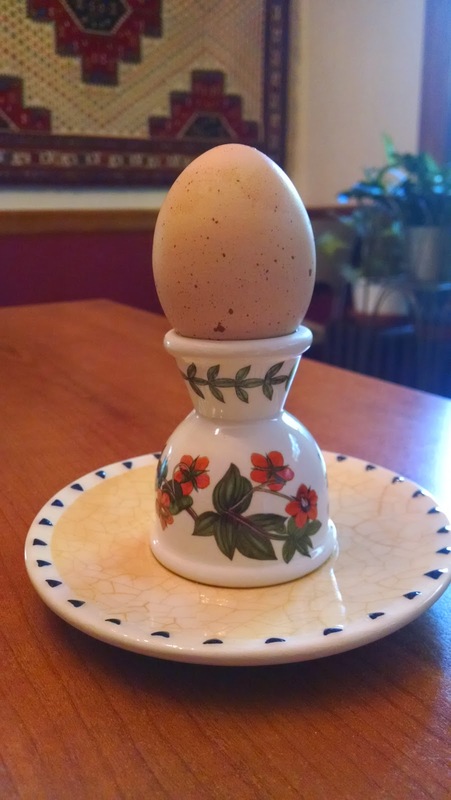 Today I made a duck liver pate using this recipe. In the freezer were all the duck livers (and one chicken liver) from all those ducks we roasted back in March. I had enough to multiply the recipe by 9 - so that meant 27 oz. of liver, 1.5 cups of shallots, 9 cloves of garlic, and so forth. I used the Cuisinart to puree it all after it was cooked, and put it all into a loaf pan. I ended up with a large brick of pate, cut it into 4 equal pieces, wrapped three of them in waxed paper and saran and froze them. If they're terrible when they are thawed, then I haven't really lost anything. Spruce puree on duck liver pate. Mmm. 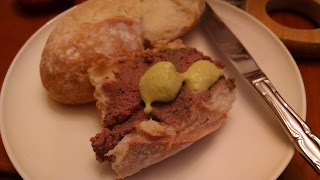 The pate (that wasn't frozen) was terrific and paired well with the spruce puree. Tonight's cheese selection was an 8 month Manchego served with guava paste (instead of quince), Robiola Due Latte, and a small fresh brie accompanied by local honey. The honey was a gift from someone I met at the hospital (if you're reading this, know that it went perfectly with the fresh brie, thank you!). Also, I made another batch of yogurt last night (so the tally so far is 3 batches from one starter culture) but it was a whole gallon of milk to start with so it'll be a while before I make more, I think. Unless we suddenly eat a whole lot of yogurt. I will, however, marinate some chicken in the yogurt tomorrow as the 10 year old loves this recipe and has been asking for it. Anything to improve that one's protein intake! Speaking of chicken, the other day I made this recipe for chicken satay and it was AMAZING. We also marinated some beef in the same marinade, also amazing. 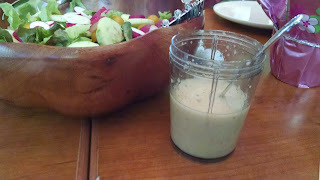 The peanut sauce was perfect. Another win in the ongoing battle to improve the breadth of the 10 year old's diet. promptly forgot. Of course I did! I remembered after I got home, and called her to apologize. She put the bottle in the desk drawer under my computer and, after 2 days, it was there when I got back to work yesterday. Thank you! 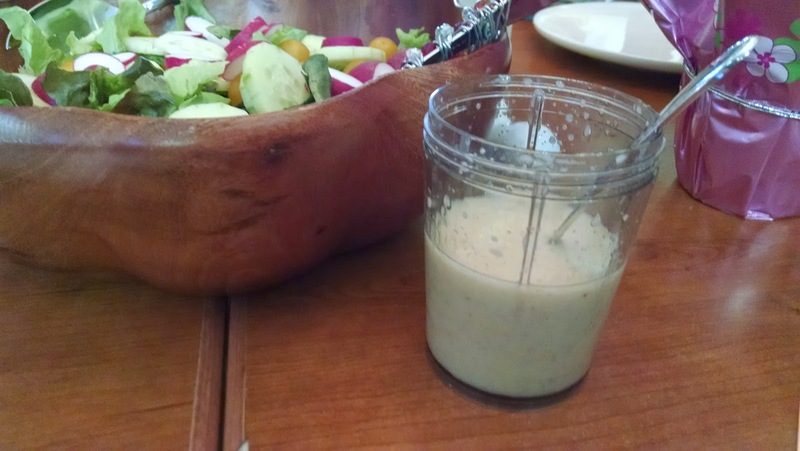 When I got it home, I poured the whole bottle of champagne into a half-gallon jar and added about 3/4 cup of that cider vinegar with the vinegar mother in it. I topped it with cheesecloth and it's resting on the counter for the next month or so. Since it loses about half its volume in the process (evaporation, I suppose) I should end up with about a pint of vinegar. 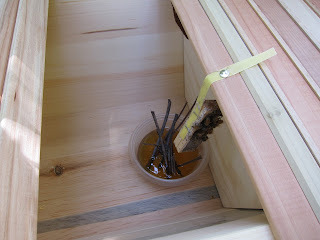 As I said yesterday, I've been playing around with spruce tips because of this blog: Forager|Chef. You should really check it out! Anyhow, today I was able to make the spruce tip ice cream I'd hoped to make. The instructions are on his blog but, essentially, you make an ice cream base, cool it to room temperature (which took half the morning), blend in the spruce tips and then filter the whole thing to get the little pieces of spruce needle out. This mixture then goes into the ice cream maker. I set my ice cream maker to soft-serve and it ran for about 25 minutes. At that point it was the correct texture and I put it into the freezer to set up some more. 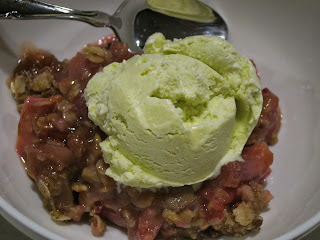 The next thing I did was make a rhubarb crisp, as that is the recommended pairing with the spruce ice cream. I baked it this afternoon and, after we made dinner, I put it into the warm oven to reheat. When dessert came around, I scooped the spruce ice cream on top. It's a complex collection of flavors: the tart rhubarb, the sweet crisp topping, and the floral-earthy ice cream. The ice cream is more "spruce-y" than the sauce I made yesterday, but that was OK because the rhubarb crisp was a stronger flavor as well. The 10 year old was not a fan - although I think more turned off by the rhubarb than anything else. Now I have a tub of spruce ice cream in the freezer, just waiting to garnish some other tart thing. Looks like there will be more experimentation in the future! So, I've been following this blog for a while: Forager|Chef. 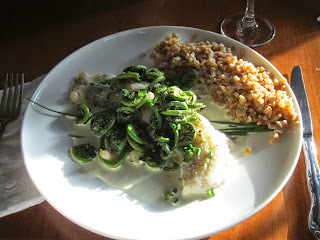 He's got a nice combination of really beautiful photos, tasty recipes, and foraging tips and I enjoy reading his posts. Many of the recipes inspire me. A while back he posted about spruce tips - both as an ingredient in savory dishes and as an ice cream. The blue spruce in front of my house is covered with new growth so I harvested about a cup of the tips and used half to make a spruce tip puree. I cut the recipe in half and, even with that, I froze half of the puree since I knew I wouldn't use it up all that quickly. He said in his blog that spruce goes particularly well with spring flavors. I came up with a combination that worked very, very well. The fish was baked with just some pepper and an herb mix, 15 minutes at 425 degrees. While that was cooking, I was simmering the farro with chicken stock. And warming up a cup of heavy cream with 3 T. spruce puree. And sautéing field garlic bulbs in butter with the fiddleheads, which had been blanched first. I also reserved the green parts of the field garlic for a garnish, whole and chopped. What I discovered is that the fiddleheads were cooked so amazingly well, and they were the anchor of the dish - they held onto the spruce-cream sauce and tied the whole combination of tastes together. The farro, which I hadn't really intended to mix with the sauce, was nothing without the sauce. The spruce flavor was subtle but lovely. I would consider thinly slicing the field garlic bulbs as they were a little bitter when left whole. Next up, I plan to make that ice cream! 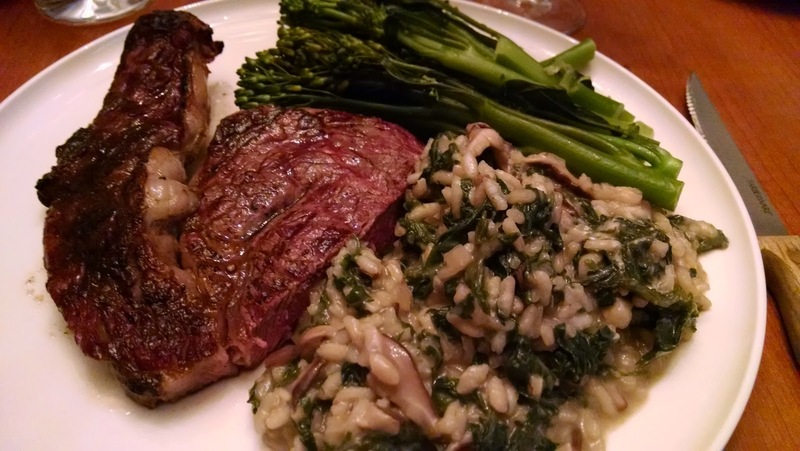 One of the recipes which really uses nettles well is this risotto from Hank Shaw. Every time I've made it, I do something different. 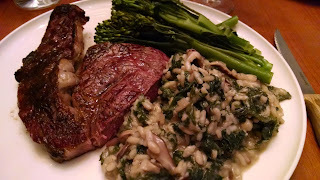 Risotto is very flexible and tolerates variation well. Sometimes I add mushrooms, sometimes I use different greens. But, in general, I follow the core of the recipe and it comes out terrific, every time. I'd blanched all those nettles the other day and set a bunch aside to make a risotto. The original plan was to make it Thursday night, but I got home late and was tired. Then, last night, I got home even later, so we ate out instead. Tonight, I was able to carve out enough time to make dinner and finally got to make this. Following the general recipe, here are today's changes: I added sliced shiitake mushrooms when I sauteed the shallots and I used a total of 2 pints of vegetable stock and one pint of duck stock. I think the duck stock really enhanced the flavor! 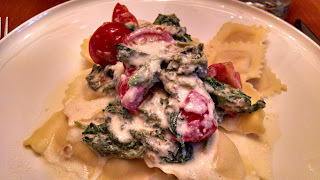 Paired with some steak and broccolini, it was just right. As most of the petit fours from the other day were taken to work, and as I wanted to try again with different "materials" I made a batch of chocolate petit fours. Yesterday I made the sour cream chocolate cake recipe and did a few things differently. 1. I lined 2 cookie sheets with parchment paper and spread out the batter in those. 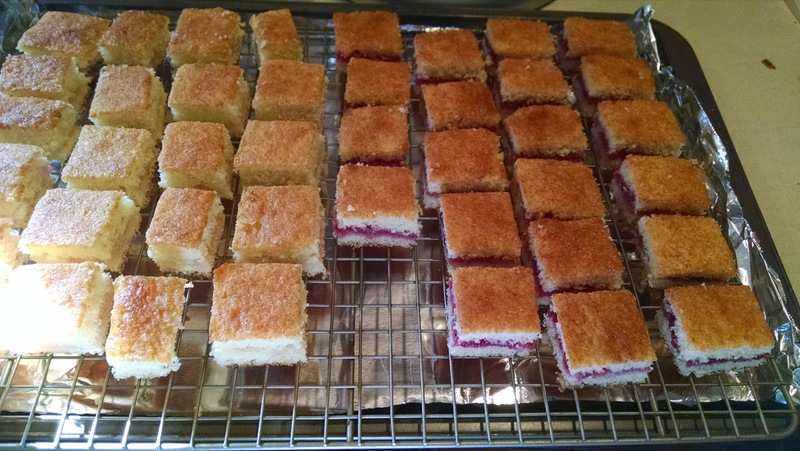 It made 2 thinner cakes, I used one for each type of petit four. Pros: the cake layers were thinner. Cons: the resulting cake is the wrong texture, the parchment stuck too much and broke the cake, and they baked unevenly in my fragile oven, so there were thicker and thinner parts and there were parts that were more done than others. 2. The layers were chilled before I started to work with them. Pros: easier to work with. Cons: really, none. 3. 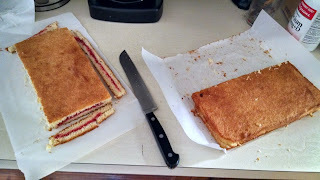 One batch had Dulce de Leche in between the layers, the other had raspberry. Pros: Dulce de leche. Cons: the raspberry ones had violets as decorations, not raspberries. 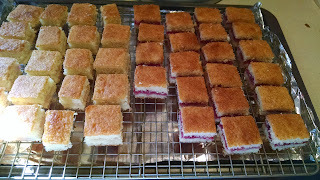 Had I been more prepared I might have managed a sugar glaze to preserve raspberries for the top. I didn't have that kind of time. 4. I made a batch of dark chocolate ganache, 10 oz. of chocolate and 10 fl. oz. of cream. This poured perfectly. 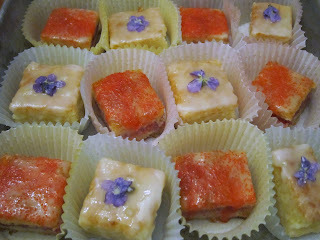 I used this batch for the raspberry ones, which were then topped with the last of my candied violets. 5. Since I needed more ganache, I made another batch with another 10 oz. of dark chocolate. I didn't have enough heavy cream, only about 6 fl. oz. so I topped that off with half and half. It completely changed the consistency of the ganache so it didn't set up as well. Even with chilling the petit fours after pouring the ganache. Also, as the dulce de leche ones were all jagged on the top, the ganache didn't even out the surface. 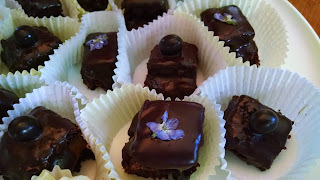 I topped these with chocolate covered espresso beans. Lesson here: don't skimp on the cream. Overall, they came out reasonably attractive and certainly tasty. Richer than the white cake ones. The white cake ones are more typical of petit fours. Lessons: stick with the white cake and, if we're going to keep doing this, invest in the correct little pans. This was whisked up in the blender. It needed more pepper, and maybe could do with a little spice. Still, it was a nice use of some of that champagne vinegar I made. I hope all the mothers out there have a wonderful day! This week we celebrate all the teachers and staff in our community! I volunteered to help set up the brunch at the elementary school this morning, and to bring cupcakes to the middle school tomorrow. I thought I'd make my new favorite cupcake, from that white cake recipe I used to make the checkerboard cake. Since this is a rather busy week for me, I made the cupcakes yesterday and frosted them today. 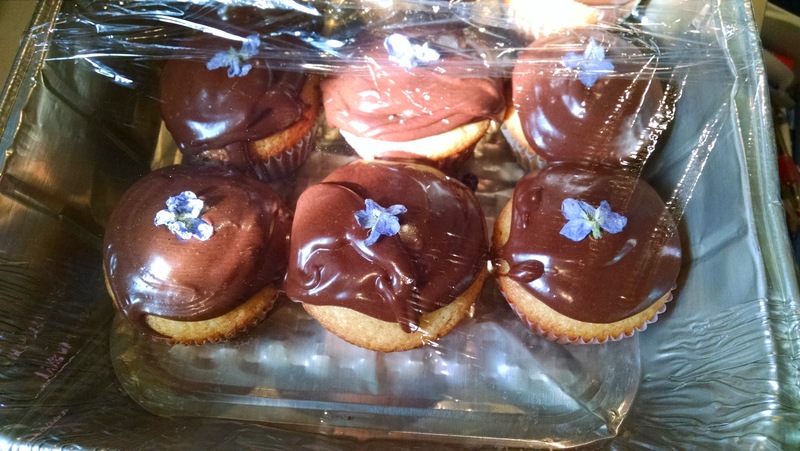 I made a half-batch of the chocolate fudge frosting I like so much, and poured it into a baggie while it was still fairly runny, then piped it onto the cupcakes. I wasn't so neat so it doesn't look as good as maybe a fancy bakery, but it tastes wonderful, so who cares what they look like? 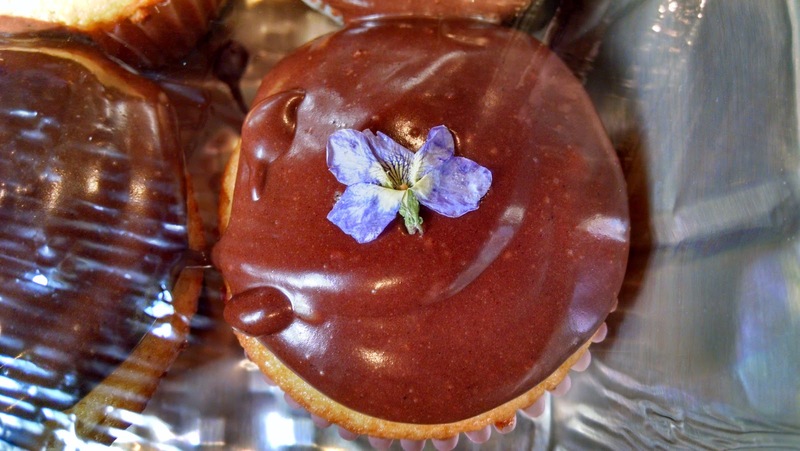 Oh, except for this: I topped each one with a candied violet. Homemade, of course. The pictures are rather terrible as they are through saran wrap and taken with a cell phone. But you get the idea. It seems that I've settled into a pattern of canning. Strawberries in June. Blueberries in July. Elderberries in August. Raspberries and peaches in September. Applesauce in October. And violets? Well, violets in the springtime, whenever that may be. Even though the warmer weather has been a little late this year, the violets have come up in full force in my friend's yard. Yesterday we were at her house for a party and she'd asked her husband not to mow all the violets, please, knowing I'd like some for jelly. There were enough to fill about 2 cups. I steeped them overnight in 2 cups of water and then, as I wanted to make a batch with the powdered pectin and forgot I needed 4 cups of violets, I steeped them again, briefly, with another 2 cups of hot water. Although the finished product isn't quite the magenta of previous years, it's a pretty lavender color. It'll do. Strangely enough, I was able to get almost 8 cups of jelly out of the batch. Last time, it made only 6.5 cups. It has been a really long time since I made any jam or jelly, and it felt good to be getting back into the swing of things.